Xavier, a colorful Croton, received severe frostbite after being left outside too late into the season and apparently continues to be out there. Xavier will continue to sit in the yard in his frozen state indefinitely. Jackie, a nun wrangler by trade, is devastated by the news. Xavier was a loyal and loving plant. His favorite pastimes were playing fetch, sniffing other plants’ pots and “marking his territory” in the backyard. Jackie let him out to do his business in the yard sometime back in September and forgot to retrieve him. It wasn’t until mid-December that Jackie realized her error. Poor Xavier was a goner. Jackie’s heart aches but she is thankful that Xavier taught her an important lesson: never trust Jackie with a dog. 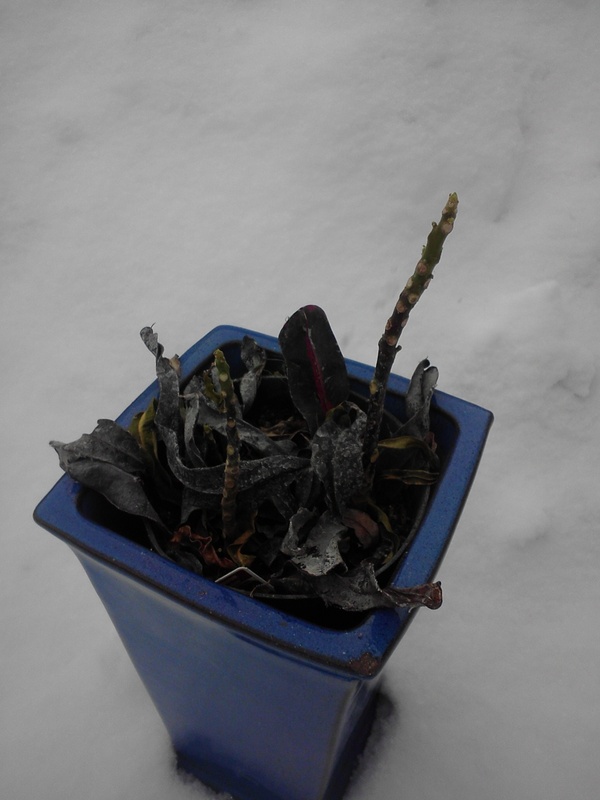 This entry was posted in Plant Obituary and tagged Devastated, Forgotten, frost, Obituary, Plant, Xavier on January 7, 2013 by Steve.